Aberdeen Central Library welcomes Norwegian crime writer Thomas Enger, author of Burned, Pierced and Scarred. 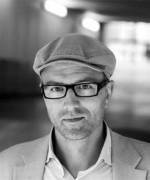 Born in Oslo in 1973, Thomas Enger is the author of Burned, the first novel of the Henning Juul series, which led to him being described as "one of the most unusual and intense talents in the field" (Independent). Further titles in the series Pierced and Scarred have also met with success. As well as writing, Thomas Enger composes music.